In this particular Tuesday morning 8th grade Bible class it’s somewhere around 8:43, depending on which clock you look at. My antique Orange Crush clock has become stubborn and recalcitrant in it’s old age, choosing at random moments in the day to run backwards. Sure enough, it’s reading 6:11 trying to spin itself into yesterday. We’re talking about what it means to have blind spots in our thinking. As an illustration, I talk about my physical blind spot, that of having a prosthetic eye. It always makes for interesting conversation and sparks a flurry of questions. “How did it happen?” Cancer. Retinoblastoma, to be precise. “Can you take it out?” Yes. Do I? Rarely. “Why don’t you just wear a patch?” Aye, matey. I could. Pirates be a fun and hearty people. But you really need something in there. “How do they make it?” It’s a fascinating process. I have a PowerPoint if you’d like to see it. “Is it bionic?” I’m not telling. By the way, I see that candy stash inside your backpack. 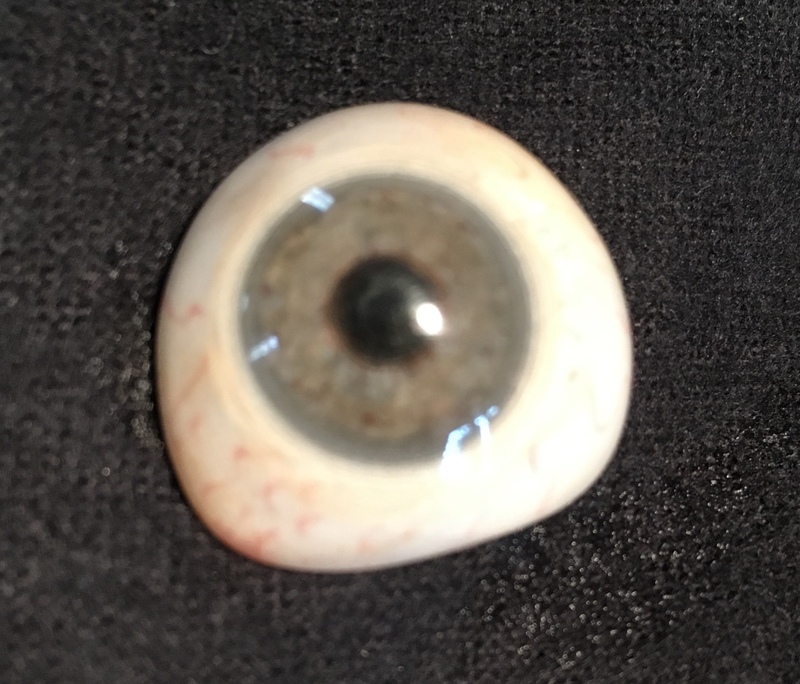 Prosthetic Eye. Made in 1980 by Wolfgang Kuss, Rochester Opticians. Mayo Clinic, Rochester MN. “You see black. I see nothing. It’s like trying to read a book with your elbow. Everyone, open your book and run your elbow over the text.” They do this and amid the laughter realize they can’t comprehend it. It’s difficult to explain what we don’t experience. It’s why the “been there, done that” stories are so impactful. When we speak from our experience we speak with the conviction that comes from having lived through the process. For example, anyone can look at a map of the Porcupine Mountains of Upper Peninsula Michigan and see the trail marked “Black Fly Swamp”. Everyone with one eye or two can see it on the map. I’ve hiked it. Having “been there and done that” I can say that you don’t want to. It’s a miserable path living up to its name. Experience beats speculation every time. That’s why your “been there, done that” stories are so impactful. We live in an age of instant information. The same students asking me questions about my prosthetic eye all carry smart phones. Which is another way of saying they have instant access to infinite data. Had they chosen to after class, they could have Googled “prosthetic eyes” and learned even more. They’d get facts. But no feelings. They’d get data. But no discernment. They’d get information. But no inspiration. Apart from human experience, knowledge is void of wisdom. Your kids, your students, your proteges, your interns. Heck, your neighbors and friends. With a few clicks on a computer they can find a “how to” on any topic. What they can’t Google are your stories. Your personal experiences. My students can YouTube a “How It’s Made” video for prosthetic eyes. But they can’t Google my embarrassing high school stories of trying to make smooth locker conversation with a girl I wanted to ask on a date, only to turn and run into the wall I didn’t see. Or what it’s like to shut my head in the door of my truck because, well, blind spots. Wherever you are today, tell your stories. We all have instant access to information. Only you can tell your stories. What are you teaching the people in your life that they can’t get from a Google search? I remember how we prayed for you when you had your eye surgery. I enjoy you posts. Hi Todd! This article was a home run! Two things you said I am going to quote often and then Im writing them in my journal! I agree wholeheartedly that that ” Apart from human experience, knowledge is void of wisdom!” I also loved and can’t wait to share,” What are you teaching the people in your life that they can’t get from a Google search?” I LOVE people’s unique God-given stories! They are the motivation for having people around our table, or a long conversation at church or being the ONLY person I know at a wedding reception! People’s stories for me, are treasures waiting to be mined. I often come away thinking, “”WOW! You can’t make that up!” This concept is particularly difficult to express to my grandkids, whose phones are another appendage. I’m praying they will listen to ” your story!” God BLESS YOU richly Todd for this wonderful thought provoking question! Outstanding writing as usual my friend!